And it’s what Phil Jones admitted in a BBC interview when he said that there had been no “statistically significant” warming since 1995. Liberals really hate when their own words are used in context. Why then am I mentioning it now? W-e-l-l, because just as ze war is to the Germans, Chappaquiddick is to the Kennedy family and that Portland masseuse incident to Al Gore, so the recent lack of warming is to the, er, Warmists. They hate it. It’s an affront to everything they believe in. Damn it, if the world isn’t warming with the alacrity they’d prefer, how are they going to keep the funding gravy train going, and how are they going to persuade an increasingly sceptical populace that the “science” is “settled”, the debate over and the time for action is now? That’s why they can’t reminded of the truth often enough. It’s like salting the slugs that are ruining your garden: necessary, but also kind of fun too. Heh, heh. Slugs. 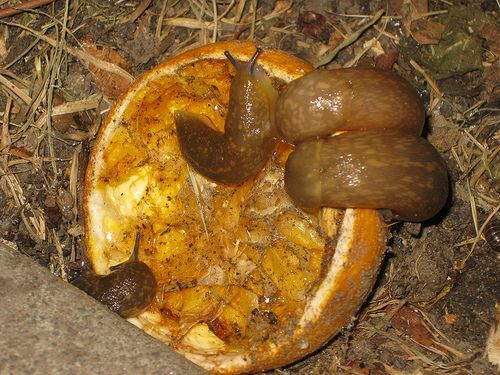 Of course, slugs can’t be indoctrinated. Which is why, since the notion of anthropogenic global warming is dying out, the leaders of the cult come up with other ways to push for more gravy. They usually do this after long fossil fueled flights on private jets, followed by rides in limos to conferences which use massive amounts of electricity, and include lots of great food. They’ve tried changing the name to climate crisis, climate change, abrupt climate change, and are trying a resurgence of climate crisis again. Over the past few years, they’ve tried out biodiversity and food security. They’ve invented a myth in which greenhouse gases make it cold and snowy. Everything that happens in the natural world is no longer part of nature (and Darwin’s theory of evolution? Right out the window), but caused by Mankind. No global warming since 1998? Simple. All you’ve got to do — as Kaufmann et al have done — is apply the Even Though We’re Wrong We’re Right Panacea Get-Out Formula. In this instance the ETWWWRPGOF (as it’s snappily known) involves Blaming The Chinese. Yep, it turns out all that pollution that Chinese are pumping into the air thanks to their unhealthy obsession with economic growth and giving better lives to their children is actually counteracting the effects of Man Made Global Warming. Since the proponents of global warming are being caught without providing supporting evidence, the theory of man-made global warming is being destroyed before our very eyes. With no hardnosed physical evidence, measurable, observable, replicable evidence, the fiction has been sustained by non-science methods. These include appeals to authority, existence of an elitist scientific consensus, computer models none of which produce physical evidence.